Turn your dining room into a winter wonderland with a display of dazzling snowballs. Whether you live in Buffalo or Miami, there’s nothing like snow to get you in the mood for the holidays. 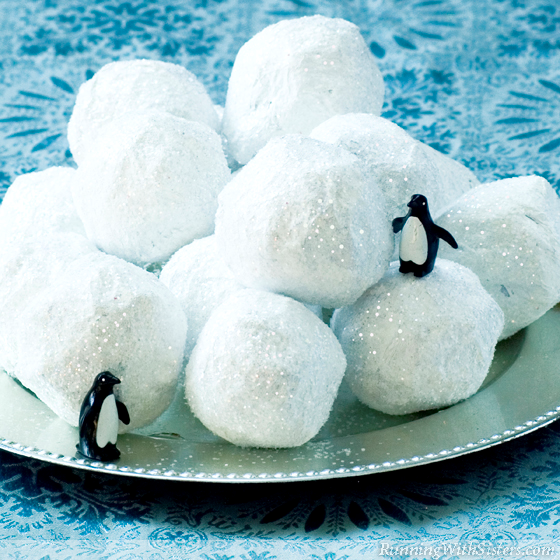 To create your own snowballs without getting frostbite, simply make balls of papier maché and dust them with glitter. Then pile them onto a shiny silver plate for a playful holiday centerpiece. And let it snow, let it snow, let it snow! 1. To get started, mix 8 ounces of white glue with 4 ounces of warm water in a bowl. Blend the mixture together with a foam paintbrush. 2. To make the snowball base, wad four pieces of newsprint into a ball. Wrap the ball tightly with two or three strips of masking tape. Repeat to make fifteen balls. 3. To papier maché the balls, tear the tissue paper into 2-inch wide strips. Using the foam paintbrush, dab a layer of the glue and water mixture all over one paper ball. Wrap a tissue strip around the ball adding more glue-water as needed. Add more tissue strips, wrapping in different directions, until the ball is completely covered. Repeat to cover all fifteen balls. Set the wet balls onto the empty egg cartons and let them dry. 4. When the balls are dry, paint each one with a layer of white craft paint. While each ball is still wet, pour glitter all over the ball until it is completely covered. Let the glittered balls dry on the empty egg cartons. 5. When all the glittered snowballs are dry, arrange them on a silver plate as a snowy centerpiece. Snow Birds: Add a touch of whimsy to your icy centerpiece with a pair of plastic penguins.